LION FIGHT AND FOXWOODS SIGN MULTI-FIGHT DEAL FOR 2014 and 2015. ANNOUNCE AUGUST THE 1ST FOR NEXT EAST COAST LION FIGHT EVENT. LION FIGHT 15, the first east coast event for the four-year-old combat sports promotion, was a total sell-out. Following the successful debut of LION FIGHT at Foxwoods Resort Casino on May 23rd, LION FIGHT Founder and CEO Scott Kent announced that he and Foxwoods Resort Casino have reached a multi-fight deal for the remainder of 2014 and 2015 to bring more of his promotion’s world class fights to the east coast. 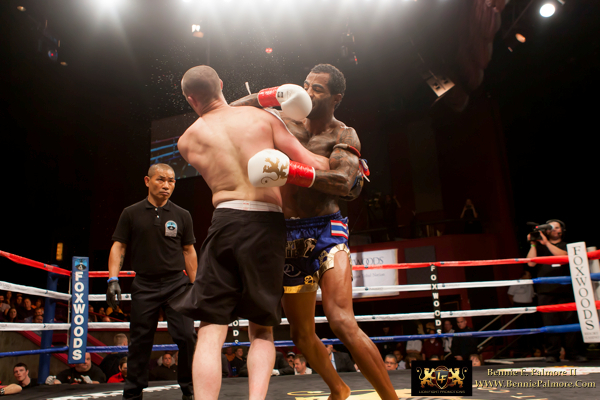 On Friday, August the 1st, world class Muay Thai is back at Foxwoods Resort Casino with LION FIGHT 17. Tickets for LION FIGHT 17 went on sale June the 10th at the Foxwoods’ Grand Theater. Tickets are available through Foxwoods.com or by calling the Foxwoods’ Box Office at 800-200-2882 or Ticketmaster at 800-745-3000. Tickets are also available at the Foxwoods box office. LION FIGHT 17 airs live on AXS TV starting at a special time, 9:00 p.m. ET/6:00 p.m. PT. Cosmo Alexandre vs. Mark Holst. Photo by Bennie Palmore II. Next up on the busy schedule is LION FIGHT 16 Friday, July the 4th at the Pearl at Palms Casino Resort in Las Vegas, which is presented as part of the UFC’s International Fight Week extravaganza. LION FIGHT 16 tickets start at $25 and are available through Ticketmaster.com. Visit LIONFIGHT.com for news, information and event updates, and follow on Twitter @LIONFIGHT. This entry was posted in Events and tagged featured, Foxwoods, Lion Fight, Muay Thai, UFC. Bookmark the permalink.